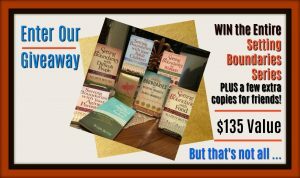 Enter to Win a Gift Basket Giveaway Valued at $235! Earlier this week, I sent a special message to the subscribers of my SANITY Support Newsletter. If you’re one of those subscribers, you know about the confession and the promise I made in this Personal Message. You also know about how to enter the $235 Gift Basket Giveaway contest. However, if you’re not a subscriber to SANITY Support, I’d like to give you the opportunity to become one and to enter this awesome contest. 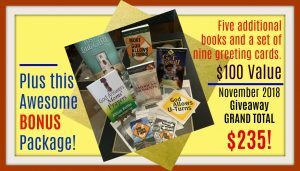 The contest deadline is MIDNIGHT THIS TUESDAY, NOVEMBER 27, 2018! I’m including the Personal Message I sent to my subscribers below in its entirety. Make sure to scroll down to click on the link that will direct you to the Contest Entry Form! I hope your Thanksgiving was filled with love and blessings galore! When you initially subscribed to my SANITY Support Newsletter, you expected to hear from me on a regular basis. That’s what I promised. 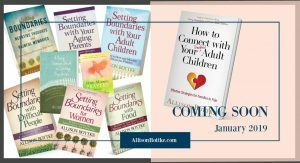 Perhaps you were interested in one of the books in my Setting Boundaries series, or maybe you were struggling with how to set healthy boundaries with a troubled adult child. Then again, you could have been tired of trying to navigate a challenging relationship with a difficult person, sibling, parent, in-law, spouse or ex-spouse, boss, co-worker, or even a neighbor. Whatever your reason for visiting my website, I’m going to assume you wanted to jump off the gerbil-wheel of insanity and find SANITY Support. Sadly, I let you down. The truth is, I haven’t been communicating with my subscribers on a regular basis. In fact, you may have subscribed so long ago that you don’t even recall signing up for my newsletter in the first place. If that’s the case, I don’t blame you for scrolling down to click on the Unsubscribe button. No questions asked. But I hope you’ll accept my apology and give me the opportunity to win back your trust. I’m thankful you subscribed and don’t want to lose you. In January of the New Year, I will be re-launching the SANITY Support Newsletter, and this time I’m going to consistently deliver what I promised—and more. I know the choices you have are many when it comes to opening and reading online newsletters. I want you to know that I value your time. My prayer is that you will remain on board and see what I have in store for you. Through this bi-monthly online publication I want to provide you with useful content and valuable resources to make healthier boundary-related choices. To learn how to effectively help—not handicap—the struggling people you care about. And to find hope, healing, and peace in your own life as well. And for those struggling with troubled adult children, my prayer is to help you find effective SANITY strategies to connect with these challenging kids in ways that empower and not enable them. When I wrote Setting Boundaries with Your Adult Children in 2009, I had no idea what the next ten years would hold. I only knew that the Six-Steps to SANITY that God divinely downloaded to my heart changed my life—and as time passed, subsequently the lives of countless hurting parents and grandparents around the world just like me. Over the years, I’ve become increasingly passionate about sharing the Six-Steps to SANITY with anyone looking for hope, healing, and freedom concerning boundary-related issues of any kind. These life-changing steps are the foundation of all seven books in the Setting Boundaries ® series, and they will play a predominant role in the SANITY Support Newsletter. I genuinely believe that no matter who we are or what challenging issue we might be facing, when we consistently implement these six-steps we can find the strength needed to jump off the exhausting gerbil-wheel of insanity and begin to replace emotional choices based on drama, chaos, and crisis with rational choices based on hope, healing, and SANITY. That said, I hope you’ll stay around to experience the power of SANITY and become a valuable part of our growing online community. And be sure to scroll down to enter for a chance to win a $235 gift basket! With the launch of the January/February SANITY Support Newsletter, I will be making several exciting announcements, including details about my newest book releasing in January, How to Connect with Your Troubled Adult Children. When this newsletter arrives in your email inbox, I hope you’ll let me know what you think. Including what works, what doesn’t, and what you’d like to see as we move forward. My goal is that the information and resources included in the SANITY Support Newsletter will provide you with a new perspective on choices, give you tools to implement effective change and shower you with inspiration to gain spiritual strength on your journey. It will introduce you to some fantastic VIP guests and outreach ministries, connect you with a community of awesome people, and even encourage you to experience the dreams of your heart—whatever they might be! Most important, following the Six-Steps to SANITY will equip you to live the kind of life God wants you to live—a life filled with joy, peace, abundance, and hope. Oh, and did I mention that our new and improved monthly newsletter will also give you opportunities to win fabulous prizes? 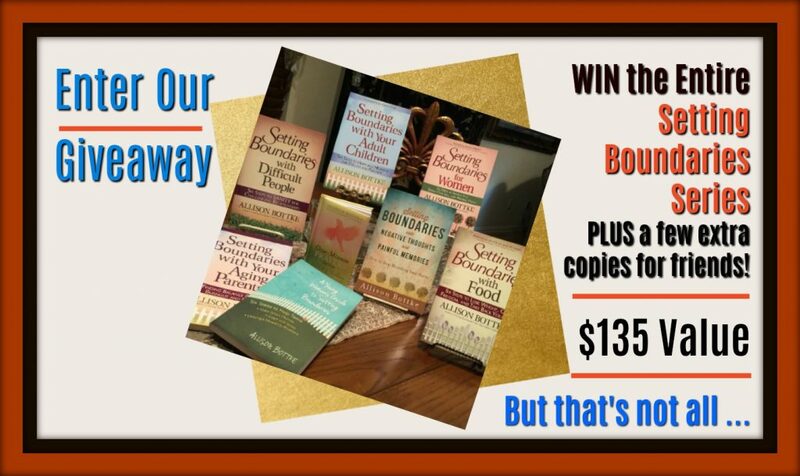 This month you can enter to win a fantastic prize package giveaway valued at $235! There is no purchase required. All you need to do to enter is click on the link below. In closing, people who struggle with boundary-related issues are often so embroiled in the lives of others they frequently neglect their own health and happiness. If you can relate, I want you to know you’re not alone. I want you to know that you can apply the “S” step in SANITY and STOP trying to fix everyone else and focus on taking care of yourself. And most important, I want you to know that making this choice isn’t selfish or self-centered. On the contrary, it’s emotionally and physically healthy and spiritually sound. Very little good can come from a broken heart. Dear reader, the mission of SANITY Support is all about embracing heart health and walking in God’s will for your life. If you’re ready to walk in your purpose, follow your passion, and protect your heart, let SANITY Support help you change the story of your life and as a result, perhaps the life of someone you care about. Until we meet again, I wish you and yours God’s peace. Oh, and if you aren’t a SANITY Support Subscriber, please visit our website to SUBSCRIBE. Several years ago, I found your book, Setting Boundaries With Your Adult Children, when I went to Focus On The Family’s website. I was at my end in dealing with my youngest (of three) son. My husband had always babied him and I did my share of enabling. My husband could not do what needed to be done, I guess, because of his own wounds from childhood. That left me to handle it alone. Through your book, I finally was set free to do the hard thing. I ended up kicking him out of our home-which a mother should never have to do. I am now in the situation of an impending separation. Again, my husband will not take the responsibility he should in trying to make something our if our 37 year marriage. I will not live the rest of my life like this. Thank you for your book. I tell everyone that is in a similar situation that your book gave me the breakthrough I needed. Jennie, I’m so sorry to hear about the consequences that have come from trying to set healthy boundaries in your relationship with your adult son. It’s even more difficult to do when spouses disagree about the “I” Step in SANITY, “Implementing a Plan of Action.” I empathize with your husband, as wounds from my childhood influenced many of my choices. So much, in fact, that I wrote a book about it. The newest book in the Setting Boundaries series is called: Setting Boundaries with Negative Thoughts and Painful Memories – How to Stop Hoarding Your Hurts. I will pray for you, your husband, and your son, that eyes will be opened, hearts healed, and hope restored. Stay strong and lean on the Lord, and remember this, the will of God will never take you where the grace of God will not protect you.